Once upon a time, there was a beautiful afghan boy living in a place far, far away. Life was not easy for him, and finally he decided to run away. Like all affies, he loved to run, so he ran and ran until one day some kind people in the Houston Afghan Hound Club rescued him. He was sore, tired, sick and injured. The kind people searched and searched and finally located his owner who said, "Keep him, he is more trouble than he is worth." He lived with the kind people and several other afghans for an entire year, eventually feeling safe enough to rest and begin the healing process. Little did he know that in another far off place someone was searching just for him. She had shared her life for 14 years with an exceptional afghan named, Omar. Sadly, Omar had crossed over the Rainbow Bridge, and while she still missed him terribly, her heart began to open in her own healing process and she realized there was plenty of room left in it for another special affie. At first, she thought that she would like another puppy to raise. Then she began thinking of all the beautiful afghans in the world that other people had thrown away. Her heart began to ache at the thought and she began dreaming about adopting a forever friend and companion. Several wonderful people along the way assisted her in her quest. Finally, as fate would have it, she discovered that she was being transferred to Houston, Texas. 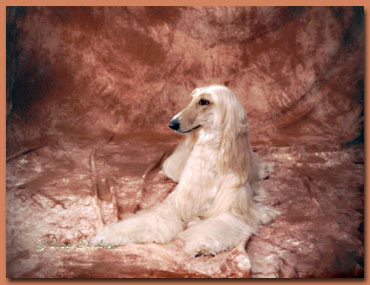 She contacted the Houston Afghan Hound Club's Rescue Program, and they began telling her stories about the many wonderful affies that were in need of a home. Meanwhile, the beautiful afghan boy had healed his physical wounds, and many of his pyschological wounds, through the love and care of the kind people in Houston. One day in early July 1998, the kind people took the beautiful afghan boy visiting. The lady who had searched and searched burst into tears when she saw him. She knew in her heart that he was the forever friend for whom she had been longing. The beautiful afghan boy stayed the night with the lady and has never left. He found his forever home, she found her forever friend and they are all living happily ever after. We will always be grateful for the dedication, patience, and love shown to Pirin by Laura, Dan, Judy, and all the folks in the Houston Afghan Club's Rescue Program, who in giving of themselves have given us the most wonderful gift of a lifetime. Hey! I'm the Star Of The Month at Afghan Rescue Families! :-) Thanks, Aunt Maureen!